The ban will include ads on YouTube, and will take effect from tomorrow. An example of Google Adwords, which appears above the search results. 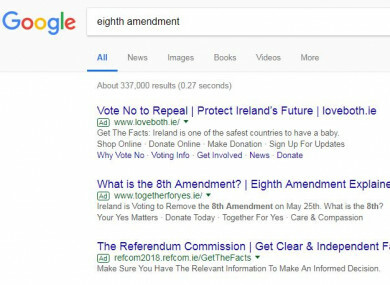 GOOGLE HAS ANNOUNCED today that it’s suspending advertisements relating to the Eighth Amendment referendum. The ban will include ads on YouTube and GoogleAdwords, and will take effect from tomorrow. Yesterday, Facebook announced that it was banning all ads on its platform related to the upcoming referendum if they are from advertisers based outside of Ireland. In a statement on its website, Facebook said that it would ban paid adverts “attempting to influence the outcome of the vote on May 25″ but added that it wouldn’t “block campaigns and advocacy organisations in Ireland from using service providers outside of Ireland”. Senator Alice-Mary Higgins said this was a “unique” reaction to the problem of online interference in political events, and hasn’t been done before. “This Irish referendum is happening in between the exposure of manipulation of elections in United States and a referendum in Britain through data targeting and micro targeting, but before the solutions are in place,” she told TheJournal.ie. She said that the Eighth Amendment referendum was a lacuna, and these actions by Facebook and Google would mean “the world is watching” to see what impact they have. Referencing a study that looked at 5 million Facebook ads in relation to the US election, she said the results found that half were untraceable, meaning they had no online footprint or point of contact. In Ireland. she says that the volume of ads has “increased significantly since last May”. On the issue of users flagging ads to be deleted when they see a problem, she said that “the scale we usually see during an election or referendum would mean that the volume becomes unmanageable the closer we get [to voting day]“. Higgins said that if tech giants don’t have the tools to filter ads in relation to elections and referendums, then they shouldn’t take the revenue gained by those ads. But she added that the bans were coming at an important time “before the vital two weeks before the referendum and the last 72 hours before the vote”. She added that there was still a need for a legislative response from governments to tackle the problem of online interference in elections. Green Party leader Eamon Ryan praised the move as “internationally significant” saying that it avoids the “difficult task of discerning where the original advertisements come from”. Fianna Fáil spokesperson James Lawless said that the announcement was “a positive development”, but that it has come “far too late in the campaign”. Fake news has already had a corrosive impact on the referendum debate on social media. There are no laws or regulations governing social media advertisements or targeting of voters by overseas organisations in relation to the upcoming referendum. A number of politicians and digital privacy advocates in the US and EU, as well as in Ireland, have called on tech giants like Facebook and Google to take more responsibility over the power their websites yield, particularly in the context of elections and referendums. Email “Google and YouTube to suspend all ads on Eighth Amendment referendum”. Feedback on “Google and YouTube to suspend all ads on Eighth Amendment referendum”.